This 4-Rib Symmetrical Pretzel Knit Cable Pattern is both symmetrical and graceful. It consists of 2 over 1 and 2 over 2 crossings. This pattern, along with the 3 others listed below, is brought to us by Story Publishing to celebrate the new release Cable Left, Cable Right by Judith Durant. 2/1LP – Slip 2 stitches to cable needle and hold in front, purl 1 from left needle, knit 2 from cable needle. 2/2R – Slip 2 stitches to cable needle and hold in back, knit 2 from left needle, knit 2 from cable needle. 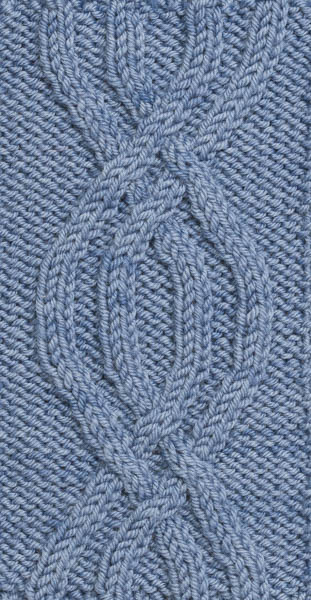 2/2L – Slip 2 stitch to cable needle and hold in front, knit 2 from left needle, knit 2 from cable needle. Is there an error? The full photo appears to show a correctly done cable in the bottom part, but incorrectly done cable in the top. 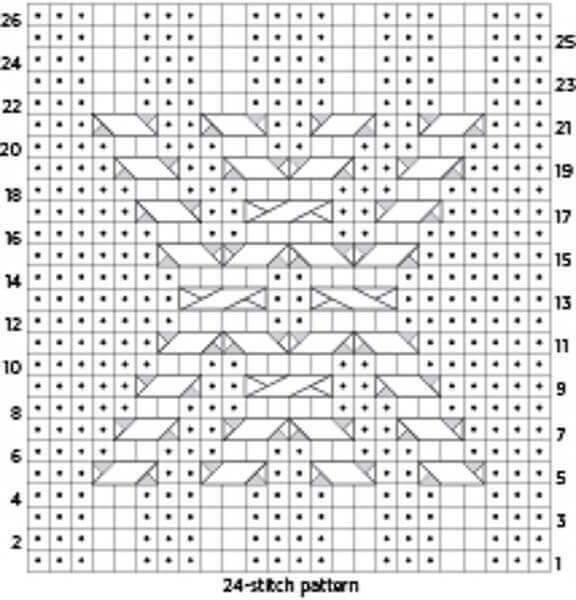 The chart reflects the error of the top cable: Both cables in row 13 should be cable to the front., or cable left. Is there a legend for the chart symbols? What does a single square represent? I’ve never done charts before.